The Biolan Heating Cable ensures the operation of the greywater filter (70 or 125) even in harsh winter conditions. Freezing does not damage the filter but in order for it to work it must not be frozen solid. The cable gently warms the greywater filter and keeps the filter operational.The cable is installed inside the greywater filter in accordance with the instructions. The cable must be connected to a fault-current-protected socket outlet. When heating is required on arriving to the cottage in winter, turn the power supply to the cable. The heating cable is thermostatically controlled so it will only come on (at zero degrees C) once the temperature drops too low and turn itself off again (at 10 degrees C). The 70 and 125 Biolan greywater filters are insulated (the light is not) so under most conditions the warmth from the water and from microbial activity will be keep the filter operational. 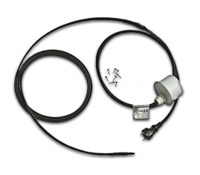 The warming cable ensures 12 month operation of the filter.